Should We Worry About GMOs? Is it a spaceship? Is it a new type of computer or smartphone? By name, a GMO sounds sort of high-tech or futuristic. But, in reality a GMO is an abbreviation for genetically modified organism. 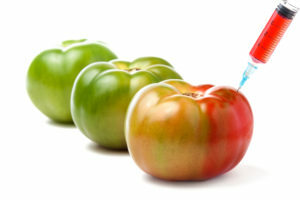 A GMO is an organism whose genetic material has been altered using genetic engineering techniques (mutation, insertion or deletion of genes). Genetically engineered crops have had genetic material inserted into them so they exhibit a desired trait, such as resistance to herbicides, pests or bringing a higher crop yield. The first GMO crop to be approved by the United States’ Food and Drug Administration (FDA) was the Flavr Savr tomato in 1994. Today, GMOs are more common than you may think. The United States is the world leader in GMO crop use, growing nearly half of global production. Approximately 85% of all processed foods in the Unites States contain GMOs. The initial studies on GMOs suggested they are safe for us to eat, and safe for our environment. As such, GMOs have been widely used across North America for close to two decades. However, GMOs are banned in Norway and restricted in the European Union. Why? The same companies that manufacture the GMO seeds conducted the initial studies, and the raw data of such studies have not been released for the public to see. More recent research is showing that eating GMO crops may pose a risk to human health. For example, French researchers noted potential health risk of three varieties of GMO corns on human health in a paper published in the International Journal of Biological Sciences in 2009. The researchers found that rats that consumed the GMO corn showed signs of damage in their kidneys and liver, the organs responsible for diet detoxification. In conclusion, the scientists point that it may not be the genetically modified crop itself that is the problem – the herbicides or pesticides designed and used with it need to be considered as well. Concerns have existed for decades about the use of pesticides and herbicides. Environmental exposure to them as humans is linked to higher cancer rates: higher rates of cancers occur in farmers exposed to high levels of pesticides and herbicides. As well, the chemicals used in the agricultural process of growing food, are still present on the foods when we eat them. In March 2015, the International Agency for Research on Cancer, a respected arm of the World Health Organization, declared that glyphosate probably causes cancer in humans. Glyphosate is the active ingredient in the widely used herbicide Roundup. Monsanto, a major manufacturer of GMOs, produces many crops that are genetically created to be resistant to Roundup, allowing farmers to liberally spray Roundup on their fields and only kill invading weeds, leaving their crop to grow more freely. It was considered a great option to yield better crops. Of note, the agency also classified two pesticides (or more specifically insecticides), malathion and diazinon, as “probable” carcinogens in March. How can we avoid exposure to pesticides and herbicides that may pose health risks? An easy place to start is avoiding the Dirty Dozen™ – that’s a list of foods that have the highest concentrations of pesticides (and other chemicals we don’t want to be eating) when tested by the Environmental Working Group in 2015. Instead, choose to buy these foods when they are certified organic, and thus grown without the use of such chemicals. These pesticides and herbicides are not just harming humans. There is a growing body of scientific evidence suggesting that the use of the pesticides and herbicides used with GMOs have the potential to cause harm to the environment. In fact, two recent studies in the journal Nature may propel regulators in the United States and Europe to reconsider the use of some forms of insecticides. The studies show that insecticide use may be contributing to the declining bee population, a major issue in food security. The first study was published in April in Nature. It noted that a commonly used class of insecticides, called neonicotinoids, “reduced wild bee density, solitary bee nesting, and bumblebee colony growth and reproduction.” The second study published in Nature, noted that some bees prefer crops that have been sprayed with pesticides, dejecting previous claims from defenders of pesticides that bees choose pesticide-free crops. Existing concerns about pesticides prompted the European Union instituted a temporary ban that set to be reviewed at the end of this year. These studies may influence their future use of pesticides. In the United States, the Environmental Protection Agency voiced their concern with this new data, and eluded to potential changes in the future use of neonicotinoid. The worst part, for those of us in most of North America, is that we don’t know if we are eating GMOs! Many developed nations (with the exception of countries like Canada and the United States) have policies requiring mandatory labeling of GMO foods. What can we do? Luckily, consumers are finding it a little easier to find GMOs these days, as an increasing number of products are indicating whether their products do not contain GMOs. The organization leading this front is the Non-GMO Project. Their blue and green rectangular symbol includes an orange butterfly on a blade of grass in the shape of a check mark, and includes the words “Non-GMO Project Verified”. For a company to be able to place the Non-GMO Project symbol on their food product (from packages of fresh tomatoes to breakfast cereals), they must prove that every ingredient in the product comes from non-GMO sources. According to the Non-GMO Project, crops at the highest risk of being GMOs are corn, canola, soybean, sugar beets, alfalfa, papaya, cotton, zucchini and yellow summer squash. Additionally, common ingredients derived from GMO crops include aspartame, high-fructose corn syrup, flavourings, Monosodium Glutamate (MSG), sucrose, citric acid, textured vegetable protein (TVP).